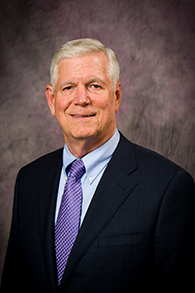 Retired U.S. Air Force Gen. Richard B. Myers has returned to his home state and alma mater to serve as Kansas State University President. He graduated from the university in 1965 with a bachelor's degree in mechanical engineering and joined the Air Force through K-State's ROTC program. Myers also is a Kansas State University Foundation professor of military history and leadership. He received a master's degree in business administration from Auburn University in 1977. He also graduated from Air Command and Staff College at Maxwell Air Force Base in 1977, U.S. Army War College at Carlisle Barracks in 1981, and the John F. Kennedy School of Government at Harvard University, where he completed a program for Senior Executives in National and International Security in 1991. Throughout Myers' active duty and world travels, he continued relationships with his friends back home. He has provided instruction, insight, and inspiration to current students and the K-State community. In 2000, he presented the 118th Landon Lecture at Kansas State University, where he spoke about the military's role in international relations. Kansas State University named the military science building, home of the Army ROTC and Air Force ROTC programs, Gen. Richard B. Myers Hall, in honor of his service and dedication. He and his wife, Mary Jo, serve as co-chairs of the Kansas State University Innovation and Inspiration Campaign to raise $1 billion.